Online registration is closed. Onsite registration available at the museum front desk. Teachers experience the ingenuity and innovation of postwar America in the exhibition American Dreams: Classic Cars and Postwar Paintings. Works representing abstract expressionism, Pop Art, and Op Art are viewed side-by-side with dream cars of the 1950s and 1960s. Following the keynote address, tour the exhibition, and attend hands-on workshops. Teachers receive 3 hours of continuing professional education credit. Space is limited and registration is required. Fee (includes dinner, workshop supplies, and teacher packet): McNay members $10; nonmembers $20. 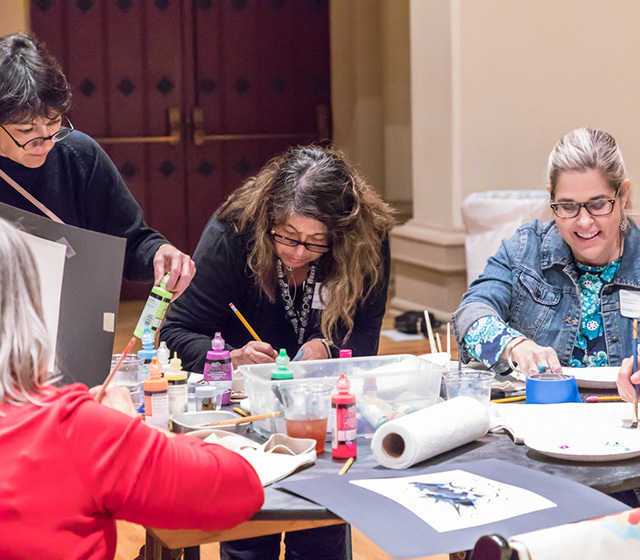 For more information, email education@mcnayart.org. Whataburger proudly fuels Evening for Educators. Make your own textural rubbing plate based on the profile of one of the cars in American Dreams. Use a digital art program to create a floating overlay that combines classic cars with history of the period. Hear from a user experience designer and participate in collaborative drawing exercises that encourage creativity. Create a text-based painting inspired by the art of Edward Ruscha.